Berwick Rangers have made five new signings in the past week, with the promise of more to come from the manager. Last week the club confirmed the arrival of three new signings - midfielders David Banjo, Charlie Denton and Finn Graham, who have all penned one year deals. It was later revealed by player-boss Colin Cameron that goalkeeper Mark Walters, previously with East of Scotland Coldstream, had accepted an offer, as had midfielder Dwayne Coutlress from Reading. But Cameron said he was not finished yet. He hopes to have another new signing, possibly a central defensive player, on board by the weekend, whilst there are plans to bring in ‘another one, and possibly two’ before the league programme starts. The latest arrivals join fellow newcomers, goalkeeper Kevin Walker, defenders Ewan McNeil, Robert Wilson, defensive midfielder Graeme Beveridge and midfielders Michael McKenna, David Morris, Barry Hogg and Calum Helm who had previous joined the club. From last season’s squad, only a handful have been retained - defenders Jonny Fairbairn (captain), and Ross Drummond, midfielder Stevie Notman and strikers Darren Lavery, Andy Russell and Blair Henderson, along with player-manager Colin Cameron himself. Banjo, 24, joins the club following spells with both Arbroath and Montrose. He made 46 appearances for Arbroath but rejected a new offer from the Red Lichties to pursue a full time career. When he was unable to gain a full-time contract he joined Montrose in January, netting a brace past league champions Albion Rovers on his debut, and going on to feature in nine games. Banjo played in several of the pre-season friendlies and will be seen as a useful addition to the squad. Denton joins from Kirkcaldy YMJFC after featuring with the first team throughout pre-season. He may be familiar to some fans as he featured as a trialist with the Development Squad on a number of occasions last season. Manager Cameron has had his eye on the versatile wide man for well over six months and the left footer will be looking to build on the form that has earned him a permanent move and break into the first team over the coming season. Graham, meanwhile, joins the club from Dunfermline Athletic, after rising through their youth ranks. 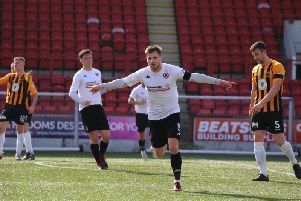 The 19 year-old, who plays central midfield, had been with Dunfermline side the age of eight and he has five senior appearances to his credit to date. On Walter, Cameron said: “Mark showed up well in pre-season, particularly against Hibs. He’s a local lad and deserves his chance. “Last year I was with Coldstream, but people have been telling me I should aim higher. Coultress also played in some of the pre-season friendlies as a trialist. “We made him an offer, but he had to go back to his family to talk it over with them,” said Cameron. “However, he has signed on now, his registration has gone through and we are pleased to have him.